There is something uniquely elegant about a winter wedding. If you're dreaming of saying the big "I do" in your own winter wonderland, then our Dazzling Snowflakes programs are for you. The top is aglow with beautiful snowflakes, depicted in a variety of stunning designs. Elegant wedding font announces your big day in white lettering, which adds a brilliant contrast to the cool blue backdrop. Or, customize with your own fonts and messages. Also available in menu, table place cards, and thank you cards. 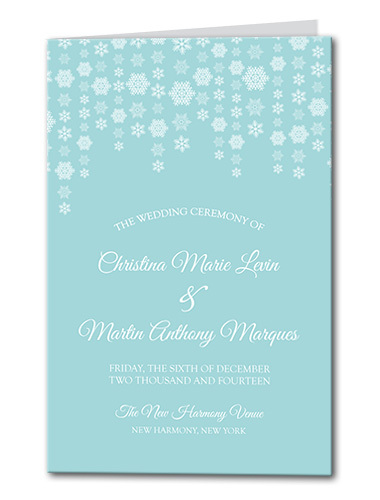 Dazzling Snowflakes Program For the best experience, we recommend personalizing your stationery on a desktop computer.